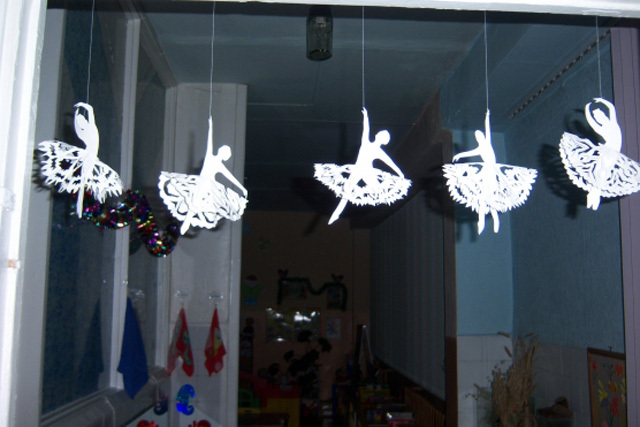 If you've seen a dance of snowflakes in ballet"Nutcracker" by Pyotr Ilyich Tchaikovsky, you will certainly understand why today we will associate dance art with water crystals. It's fine! It's so beautiful that I want to watch more and more. 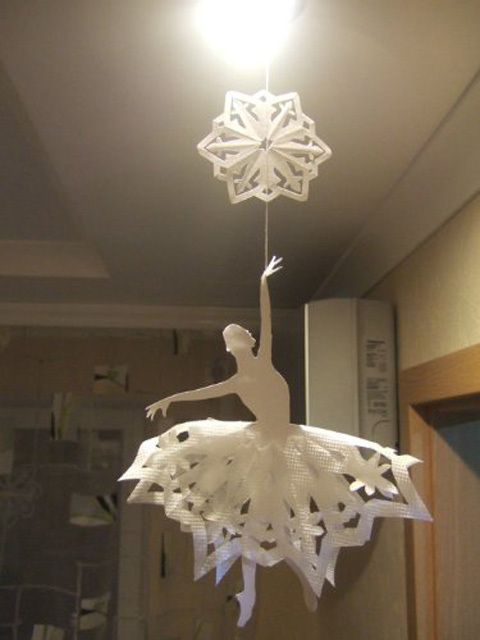 To admire the flight of a snowflake, just like a ballerina dance can be endless. 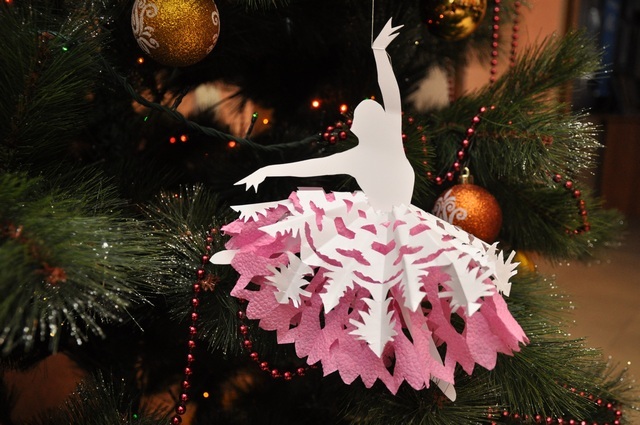 Why not combine two beauties in one New Year's hand-craft paper? 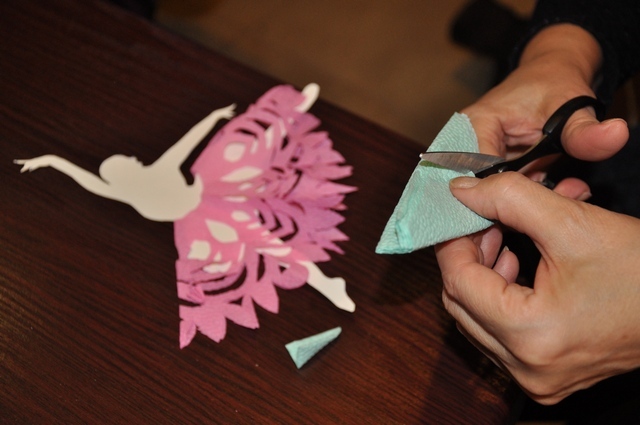 In order to make our New Year's souvenir,We need to cut out a ballerina from paper. 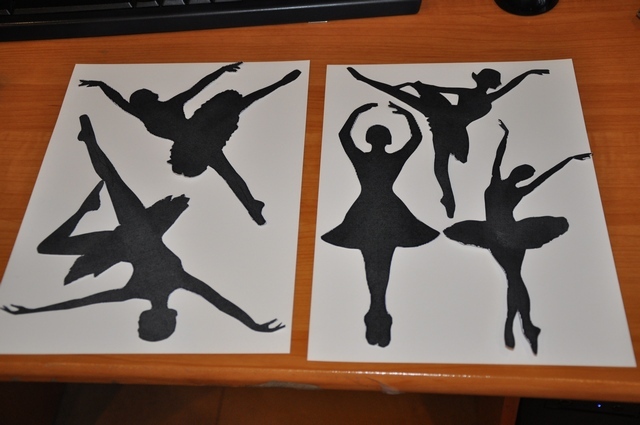 You can draw it yourself or copy it and print it on the Internet. The main thing is that she already was in the pack, that is, in the skirt. 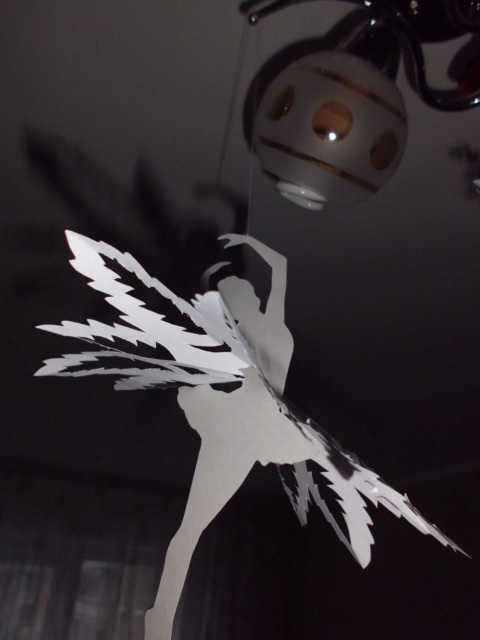 To create a flat image of a dancer, use thin cardboard or thick paper. 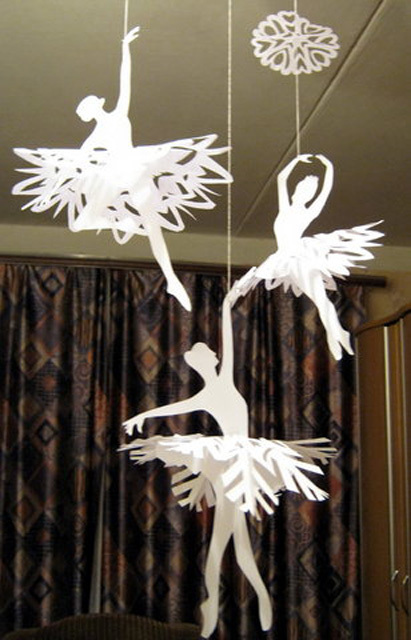 Cut out the snowflakes from colored paper so that they dressed in our beauty. That is, we cut through the middle of a snowflake. 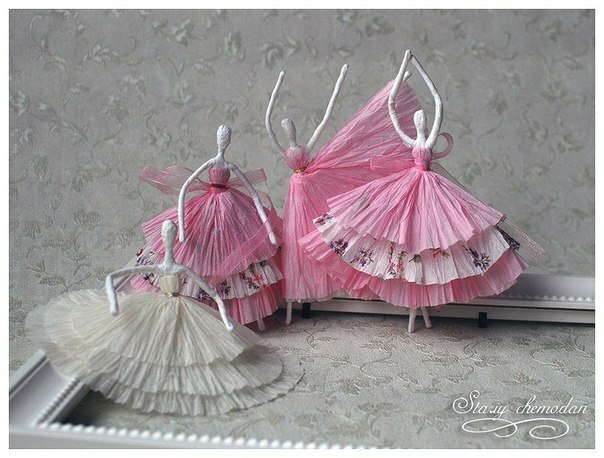 You can make several skirts from paper of different colors and different diameters. 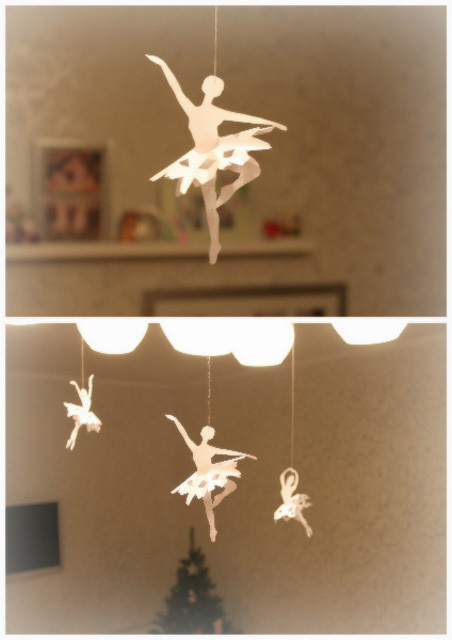 Dress the girl, fixing the glue with droplets of glue. Now it is very fashionable to wear multi-layer clothing. Let our dancer be at the peak of fashion. 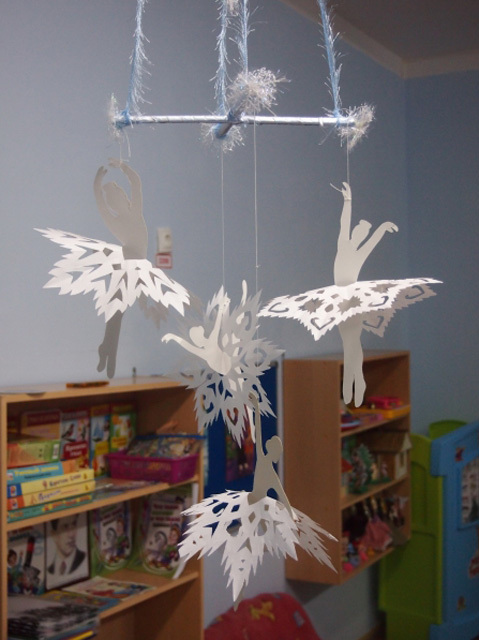 A real snowflake is always hexagonal. 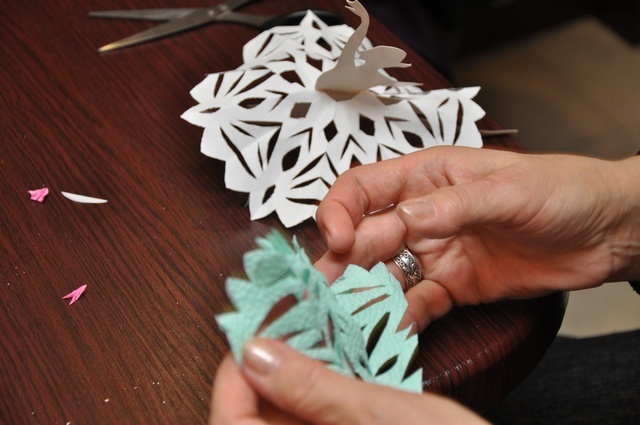 The photo shows the sequence of folding paper for the hexagonal workpiece. 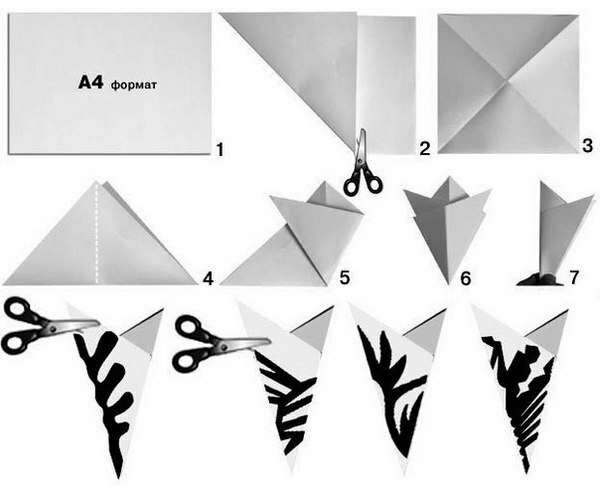 Fold a square sheet of thin paper in half. At this stage it is recommended to use protractor, and you can rely on the eye and divide the deployed angle into 180o into three equal parts, that is, 60o. 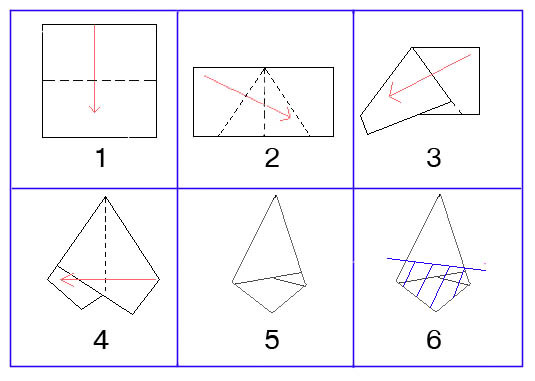 Mark the middle of the rectangle and fold it, as shown in the photo. It is important that all faces coincide. Fold the resulting triangle again in half. 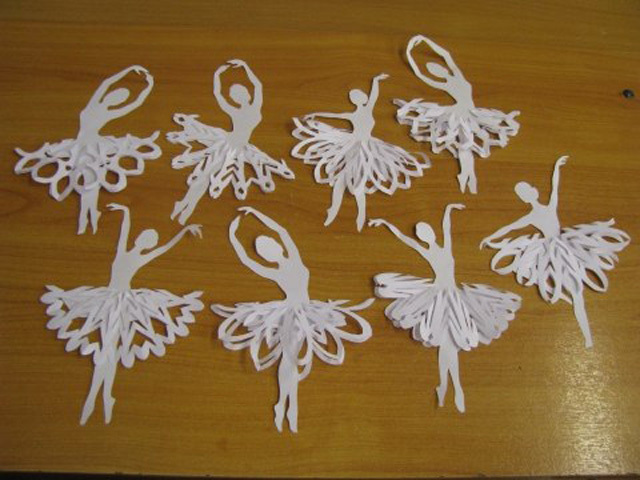 Cut off any irregularities in the edge of the paper. 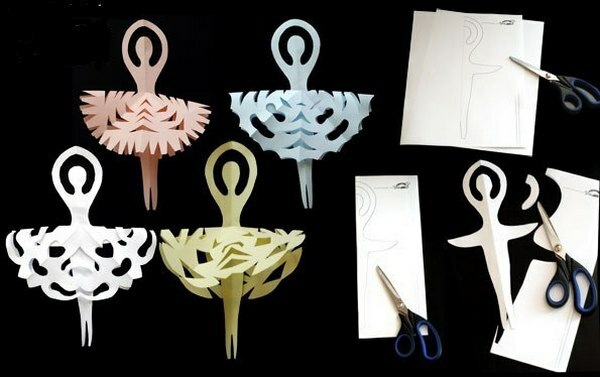 We received a blank from which you can make a skirt for our ballerina. 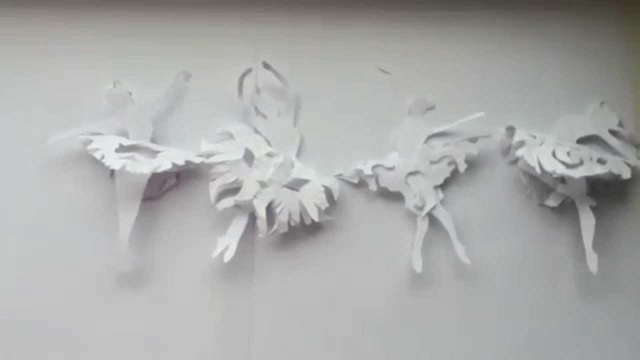 There is a slightly different sequence of folding paper. But the result is the same. 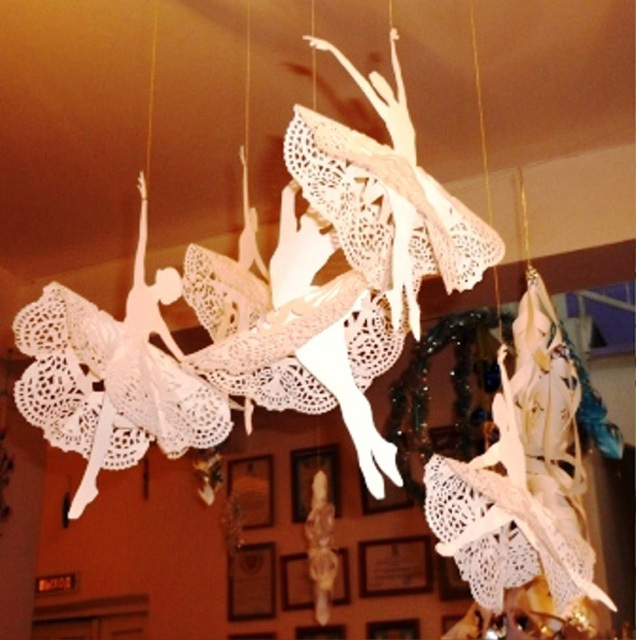 Take a piece of wire and twist out of it the stylized figure of a man. Thin toilet paper is moistened in glue and wraps it with a wire frame, building up the muscle mass of a wire man. 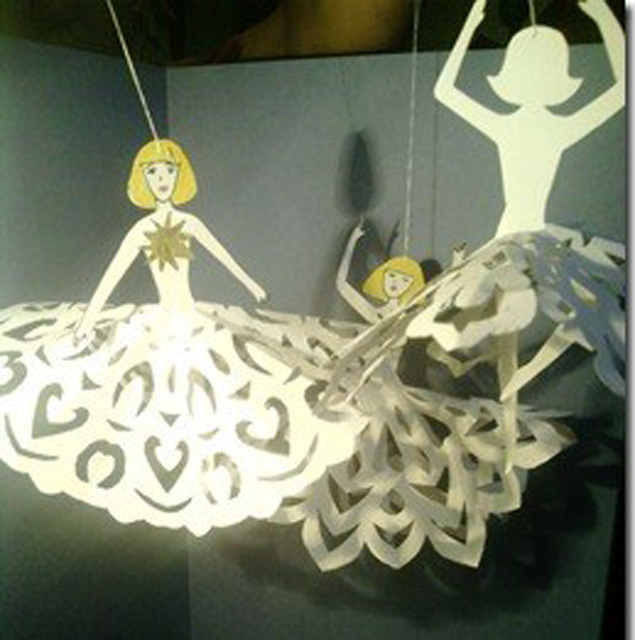 Cut off a long strip of corrugated paper and glue it to the waist, collecting in a magnificent bell. 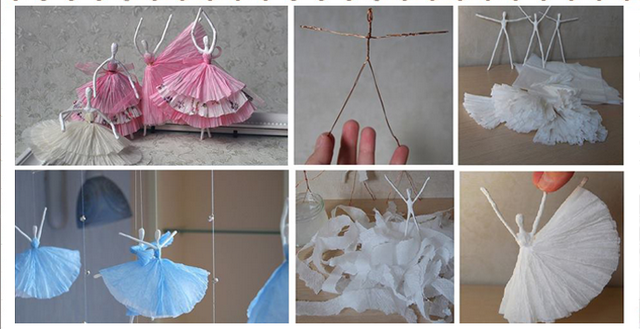 Elegant dresses look like on a wire ballerina, which consist of several layers of paper. 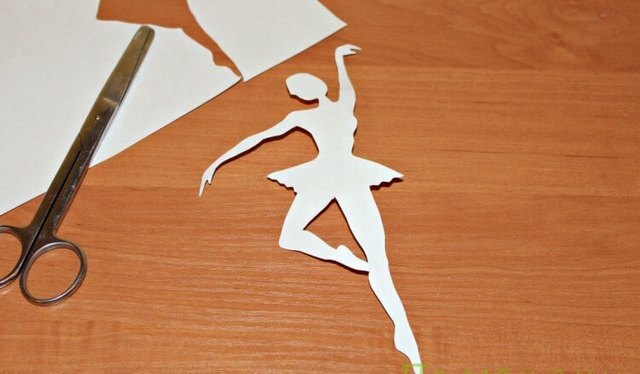 We cut out from the paper a symmetrical dancer,drawn on a stencil on pre-folded paper. Do not forget to leave on it a short skirt, sticking out to the sides. 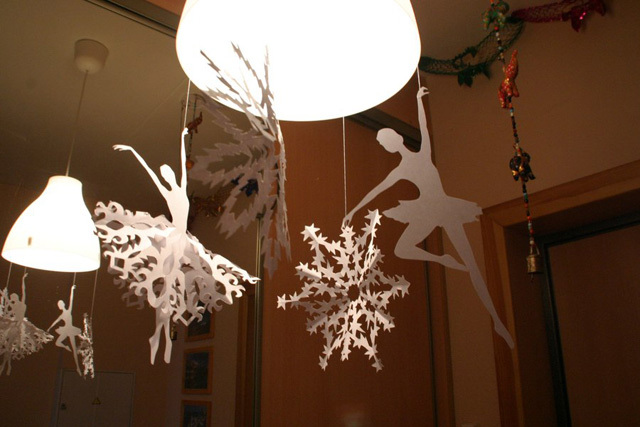 On it will be a snowflake. 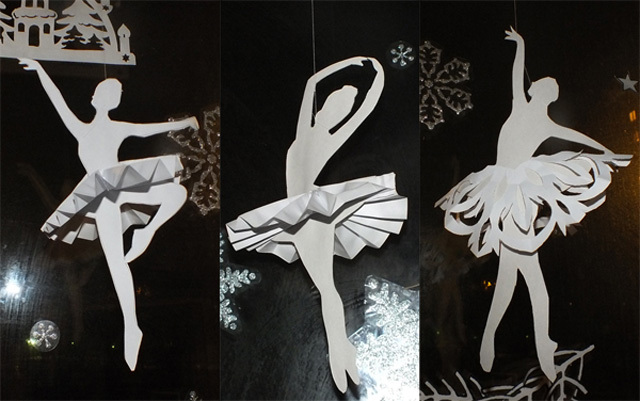 We cut out snowflakes from thin paper and put them on ballerinas. 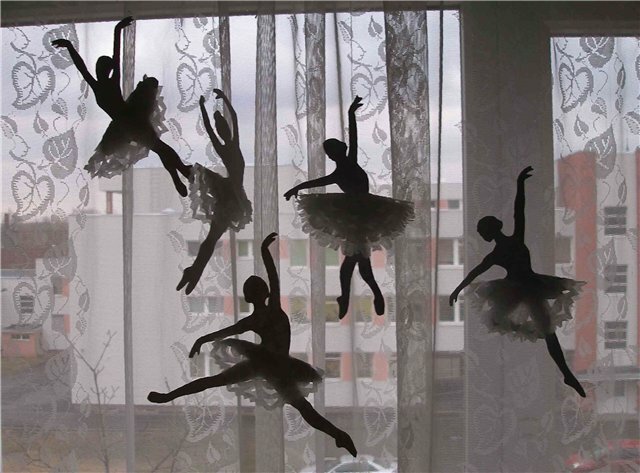 We string all the dancers on a string and hang them in a garland. 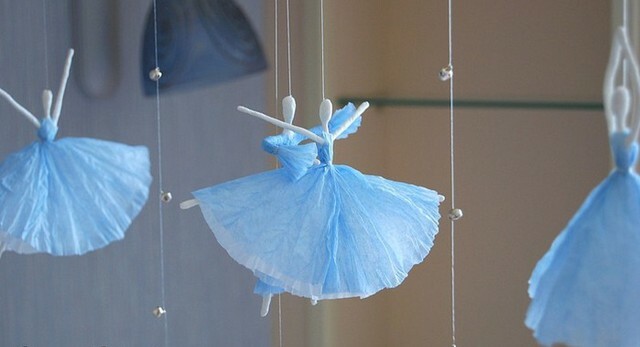 Dress a beautiful woman and pin it on the tulle.